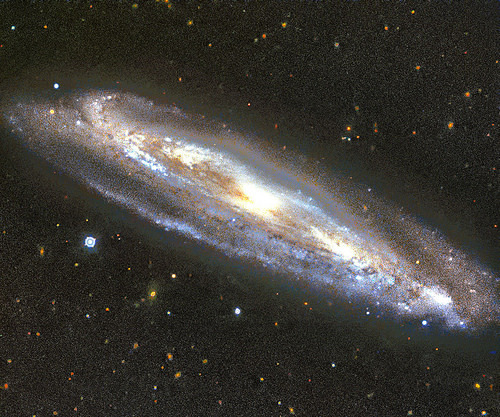 Edited European Southern Observatory image of the galaxy M98. Color/processing variant. Original caption: The colour blue has many associations — coldness, sadness, serenity. However, the colour holds a completely different meaning for astronomers, as demonstrated by the edge-on spiral galaxy Messier 98. Messier 98, also known as NGC 4192, is located approximately 50 million light-years away in the constellation of Coma Berenices (Berenice’s Hair). In this spectacular image from ESO’s New Technology Telescope (NTT), the galaxy’s perimeter, rippled with gas and dust, is dotted with pockets of blueish light. These are regions filled with very young stars, which are so hot that they glow with a bright blue hue. These young stars are burning at such high temperatures that they are emitting fierce radiation, burning away some of the dense material that surrounds them. In total, Messier 98 is thought to contain one trillion stars! The NTT is a 3.58-metre telescope at the La Silla Observatory, which pioneered the use of active optics and was the first in the world to have a computer-controlled main mirror.